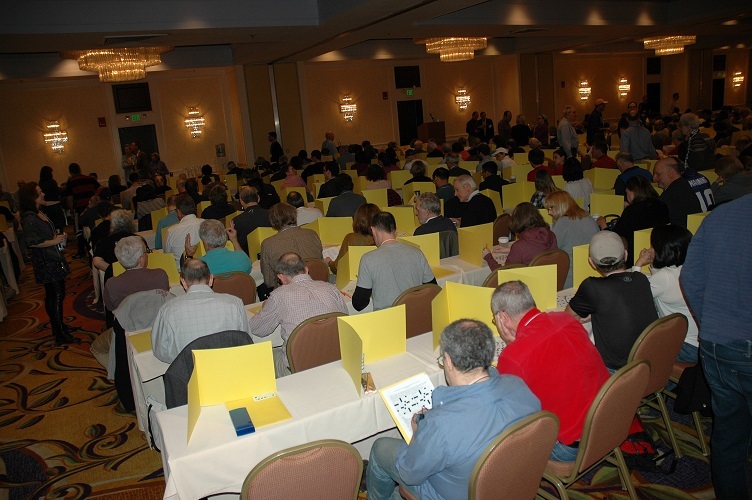 Delving into the ACPT puzzles! 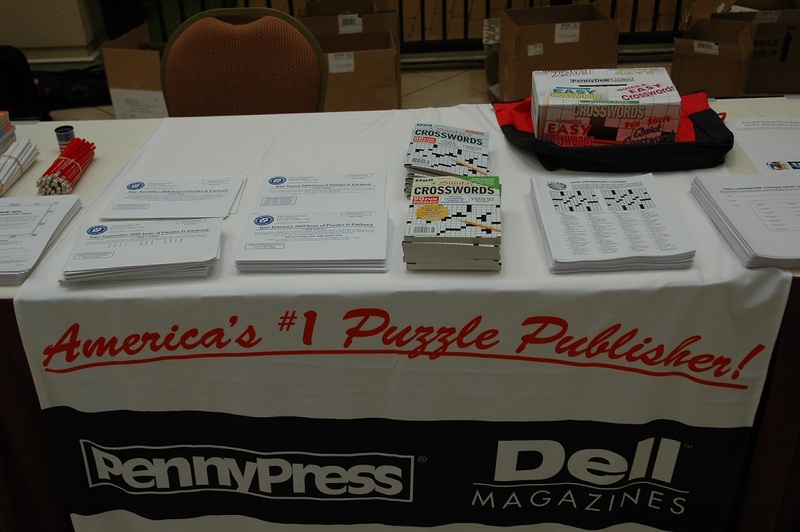 One of the highlights of the puzzle year is the American Crossword Puzzle Tournament, and the impressive, challenging, and well-constructed puzzles awaiting solvers there rank among the craftiest you’ll ever see. 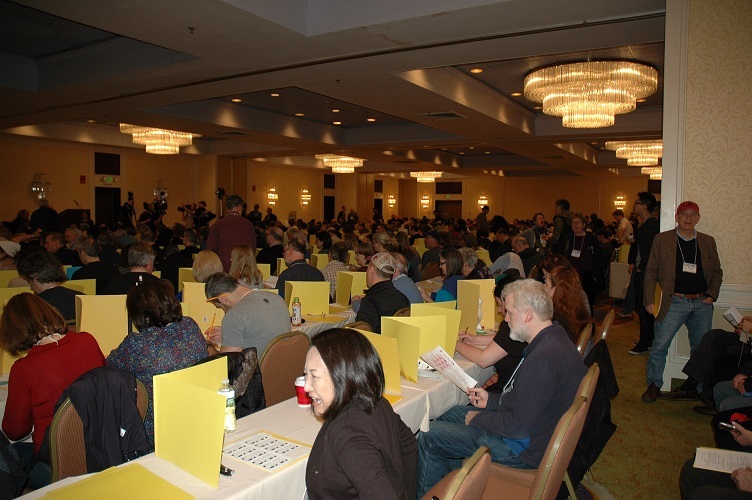 The opening puzzle was an excellent introduction to tournament solving, well-constructed but not too challenging. 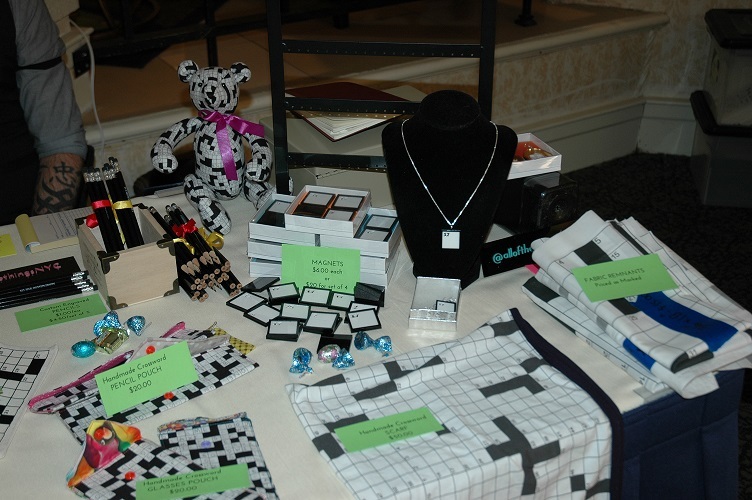 The grid featured two shaded 2×2 blocks within the fill (containing the word CELL), as well as three themed entries and a revealer for those shaded squares (CELL BLOCKS). The theme entries themselves were jail-themed phrases punnily clued, and they were very accessible. Interesting grid entries included SCOPE OUT, BILOXI, GAUSS, and my favorite clues were “Something done by a prisoner” for TIME, “Spade doing a lot of digging” for SAM, and “Place to find a spare tire?” for ABDOMEN. This was a very solid Puzzle 1. 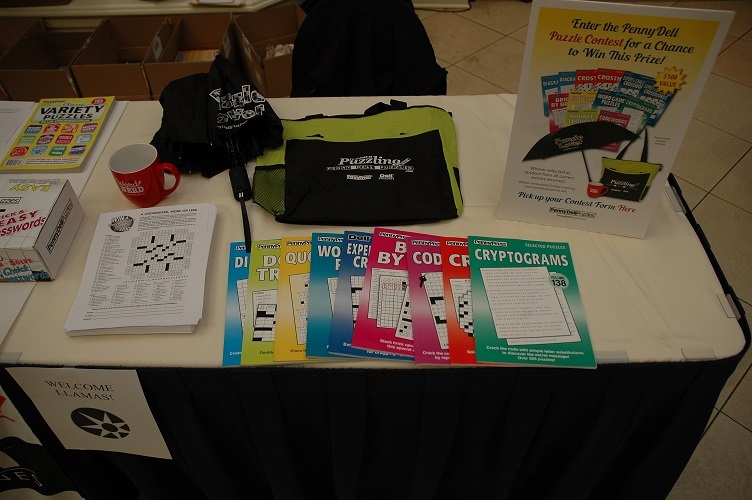 Patrick is a top name in puzzles, and he set himself quite a constructing challenge with Puzzle 2. Not only did every clue start with the letter T, but every entry, both across and down, included a T. Very impressive. 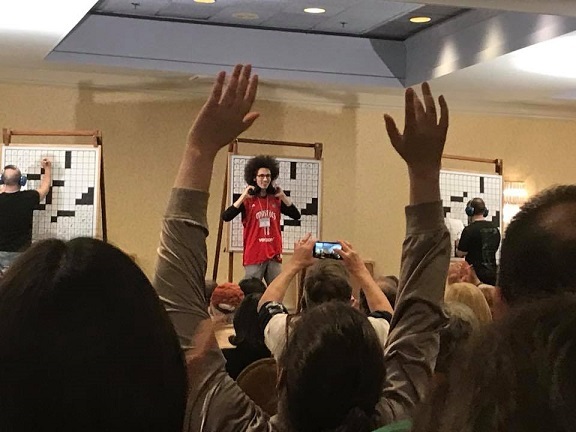 If you read my recap of the tournament, you’ll recognize this as the puzzle with the diabolical crossing of CONTE and CORTANA that flummoxed so many competitors, but honestly, I found the entire upper-right corner to be tough. Much tougher than the rest of the puzzle, comparatively. Otherwise it was a very accessible grid, but one that asked a bit more from solvers than Puzzle 1. Interesting grid entries included SPIN ART, SANTANA, and CORONET, and my favorite clues were “‘That’s all folks,’ for Mel Blanc” for EPITAPH and “Trojan material” for LATEX. 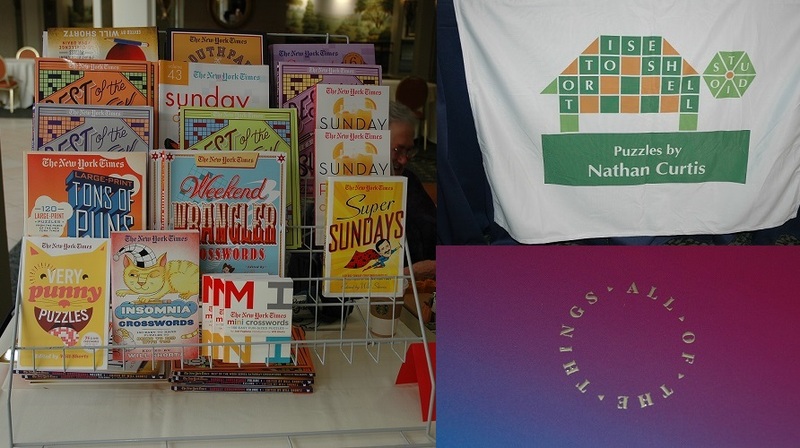 This time around, each of the theme entries was a television show with one letter missing. For instance, “TV series about a driver rear-ending another motorist” clued BRAKING BAD. Together, the missing letters from each entry spelled the word CENSOR reading down in the lower-right corner. This was very clever construction, and the puzzle offered some fun wordplay with the “new” shows as clued. But there was something else lurking in the grid. The lower-right corner featured a pretty diabolical crossing that could’ve misled solvers. The correct entries were ROMANI crossing CRIER at the I, but a solver could easily fill in those entries as ROMANY crossing CRYER. Pretty sneaky. Interesting grid entries included BOSWELL, NO MAYO, and A TO Z (as well as the way-too-hard for this puzzle AZUSA), and my favorite clues from the puzzle were “River past Memphis” for NILE, “Sch. 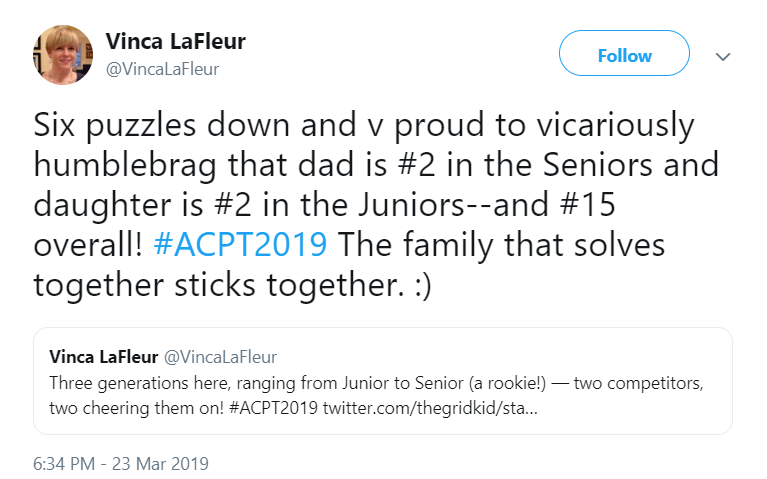 for fathers-to-be” for SEM, “Focus on the road” for CAR, and quite appropriately for the tournament, “Didn’t get the 150-point solving bonus, say” for ERRED. 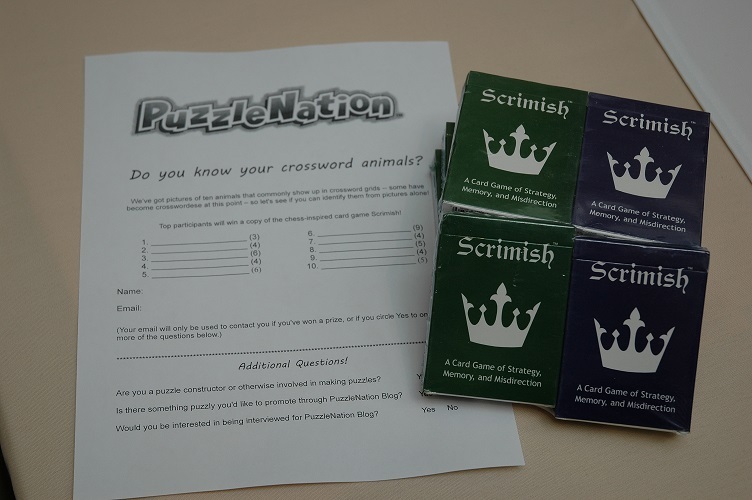 This was the toughest puzzle thus far, as some of the entries were simply clued with a symbol like “/” or “[ ]” and you had to come up with the theme answer that fit the symbol or symbols. 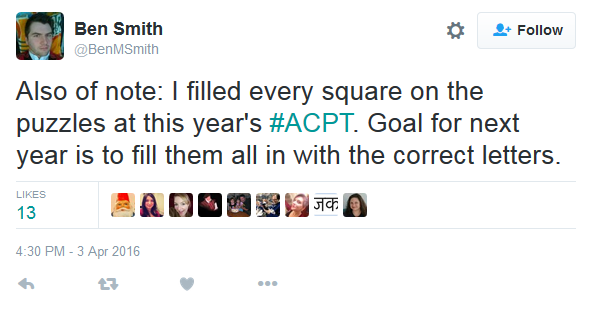 For instance, CUT SHARPLY (slash) and TAX LEVELS (brackets) were the answers to the above clues. Very crafty. Given the challenge level, this felt like a good warm up for the infamous Puzzle 5, which was looming next. 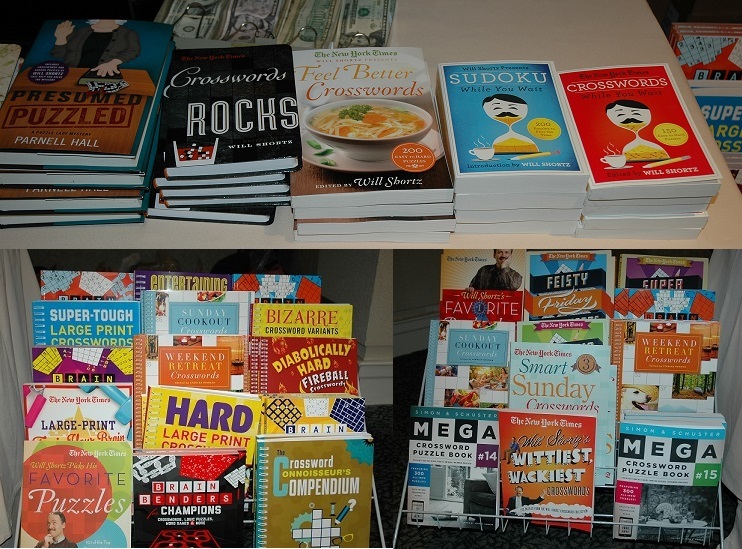 Interesting grid entries included C’EST LA VIE and NO FEAR ACT, and my favorite clues were “Set in stone, say” for ETCH, “Fails to finish a sentence?” for ESCAPES, and “Pound note?” for ARF. There are two sounds I’ll always associate with the tournament. 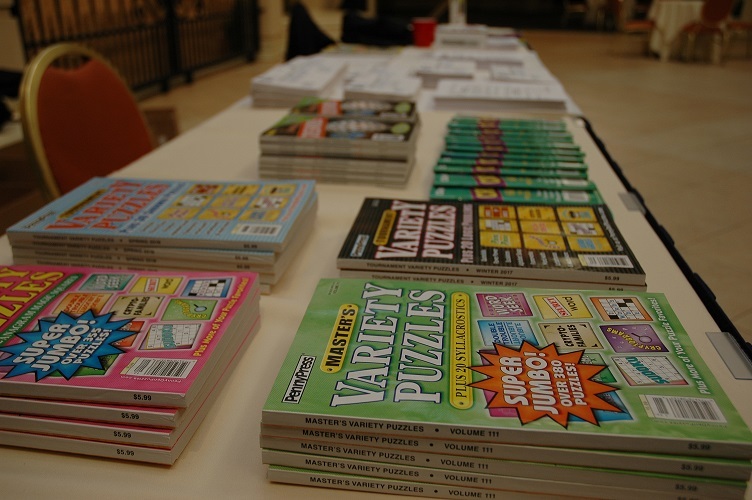 The first is the whoosh of everyone turning over their puzzles and beginning at the same time. The second is the groan that accompanies the timer running out during Puzzle 5. I admit, this one melted my brain. I got that some of the entries would shift from reading down to reading across and back again (in a zigzag pattern), but it took me a long while to realize that those “lane changing” entries would share those unclued lines reading across, but in the other direction. 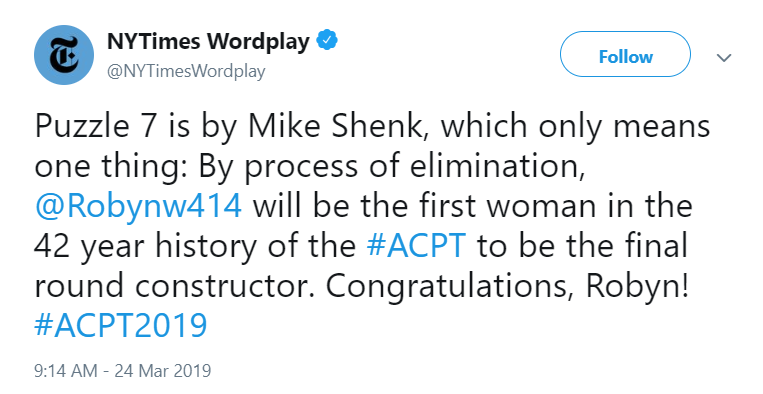 Had I been competing in the tournament, there’s no way I would have completed this one within the 30-minute tournament deadline. Brutal. Interesting grid entries included CAR TALK, BOB VILA, TOLTEC, and LION CUB, and my favorite clues were “Drawing room?” for ART STUDIO and “Block lettering?” for LEGO. Rounding out Saturday’s competition was a nice mental palate cleanser after the diabolical Puzzle 5. 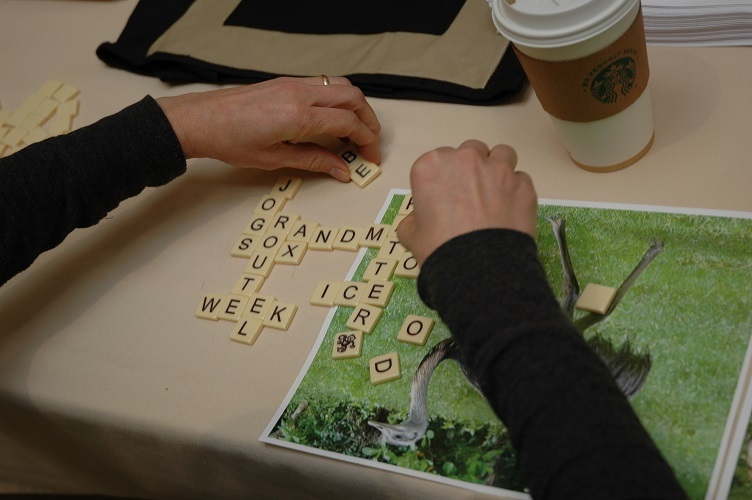 In Joel Fagliano’s contribution to the tournament, the letter “I” added to standard phrases to make them comparative (like “Quaker State” becoming QUAKIER STATE comparing California to Nebraska). It’s a neat hook, one easily gettable for solvers already rundown by Puzzle 5. Interesting grid entries included BBQ PIT, I RAISE, FOOD COMA, and RAZZIE, and my favorite clue was easily “Girl who’s coming back with something valuable?” for TESSA (asset backwards). Sunday started off strong with this well-read entry by Lynn Lempel. 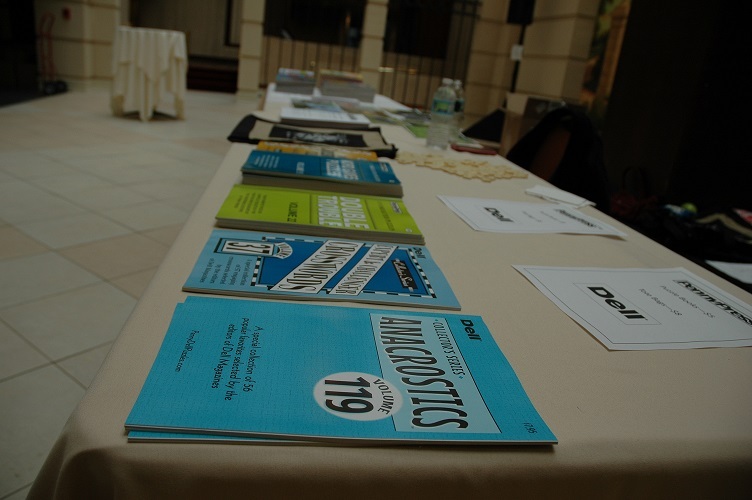 As indicated by the title, the themed entries were novels with the last word in the title anagrammed. For instance, “Lord of the Flies” becomes LORD OF THE FILES and “Tender is the Night” becomes TENDER IS THE THING. A solid closer with lots of accessible crosswordese, this puzzle was perfect for easing solvers out of tournament mode right before the big championship showdown. Interesting grid entries included ALVIN AILEY, GANGSTA, ACOLYTE, and STEPS ON IT, and my favorite clues were “Soprano not known for music” for CARMELA and “Manhattan spot” for BAR. And then, we were down to one. 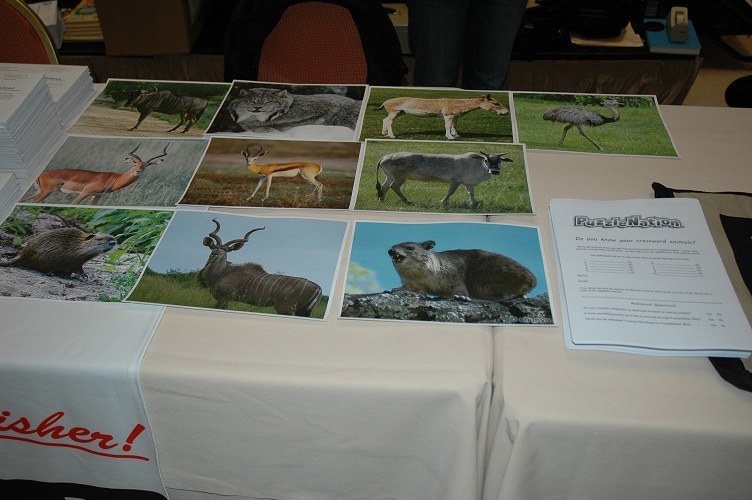 The final puzzle of the tournament offered three sets of clue difficulties (A for the top performers, B for the solid performers, C for everyone else). And there were a lot of longer entries crossing in this grid, so there were fewer giveaway words to get you started. I solved it with the B clues, and still with some difficulty. 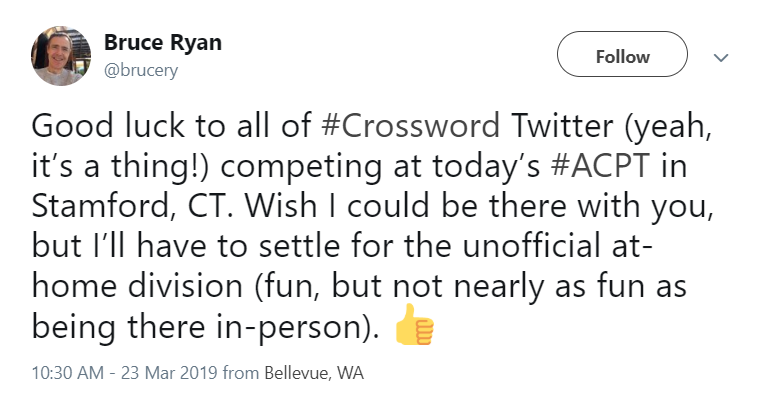 Interesting grid entries included PARLANCE, TOOK A HINT, and RARIN’ TO GO, and my favorite clue was easily “They have wings but never leave the ground” for SNOW ANGELS. 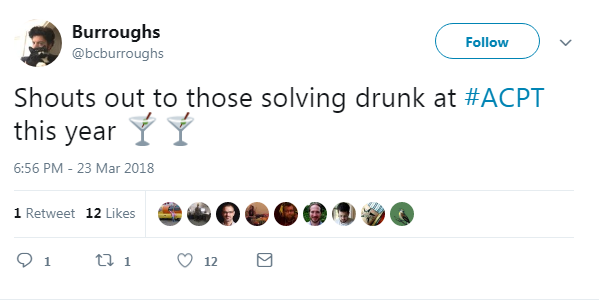 Overall, I was impressed with the quality and ingenuity of puzzles we saw in the tournament, and as always, it reminded me of just how quick, how cunning, and how clever many of the tournament solvers are. These puzzles were a real treat. 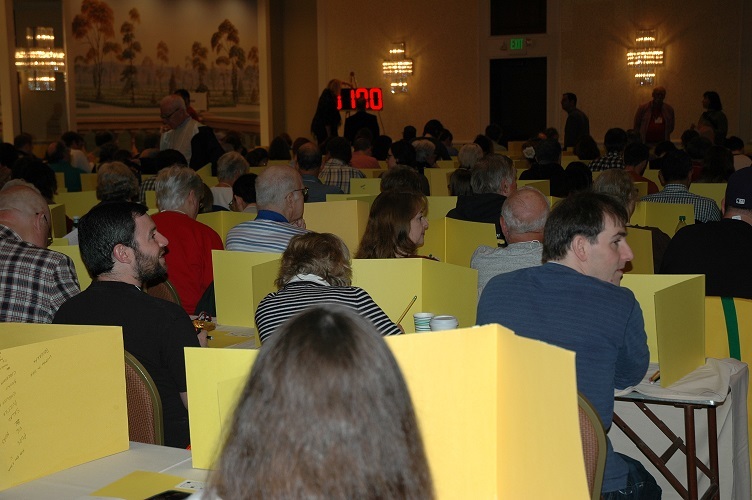 The tournament takes place over two days — with six puzzles to solve on Saturday, followed by one on Sunday — and then the championship puzzle, which the top 3 solve on white boards in front of the audience. 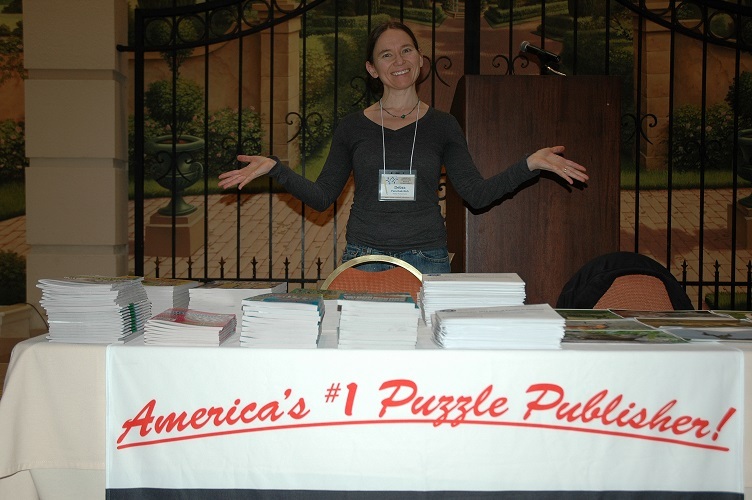 On Friday and Saturday night, there are often puzzle events, demonstrations, and panels by top puzzlers and figures in the puzzle world as well. 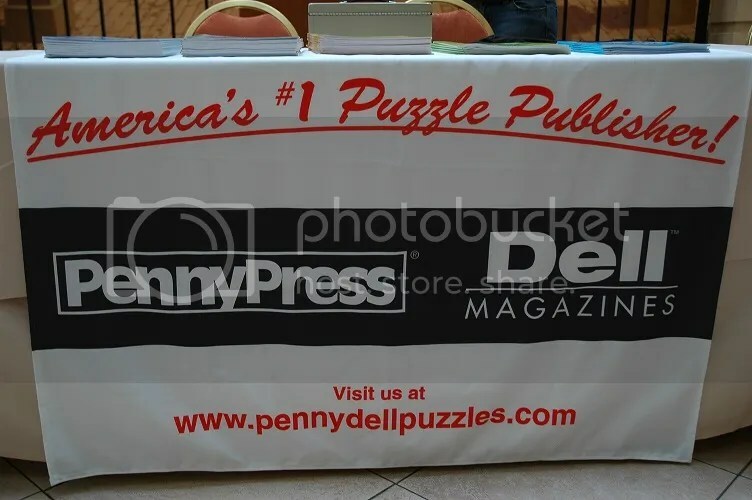 I ventured down to Stamford myself Saturday morning amidst some unexpected snow flurries and sat in with my friends from Penny/Dell Puzzles at their booth. 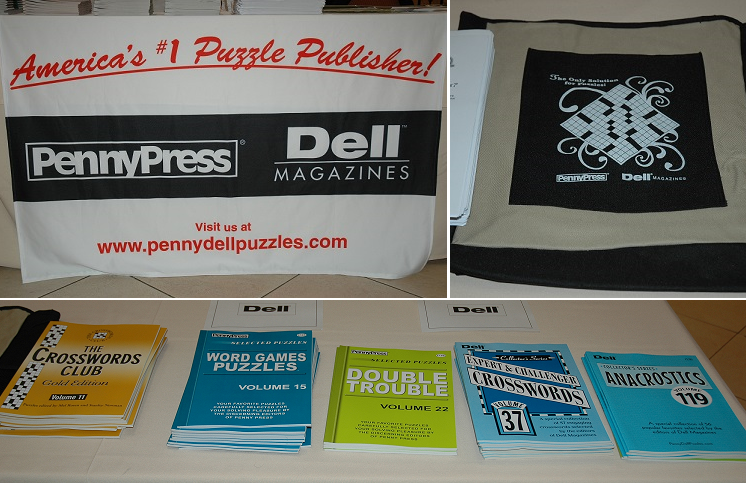 They were armed to the teeth with tote bags, magazines, pencils, and freebie copies of The Crosswords Club, The Uptown Puzzle Club, Will Shortz’s Sudoku, and some of the tougher Penny Press and Dell Magazines titles. 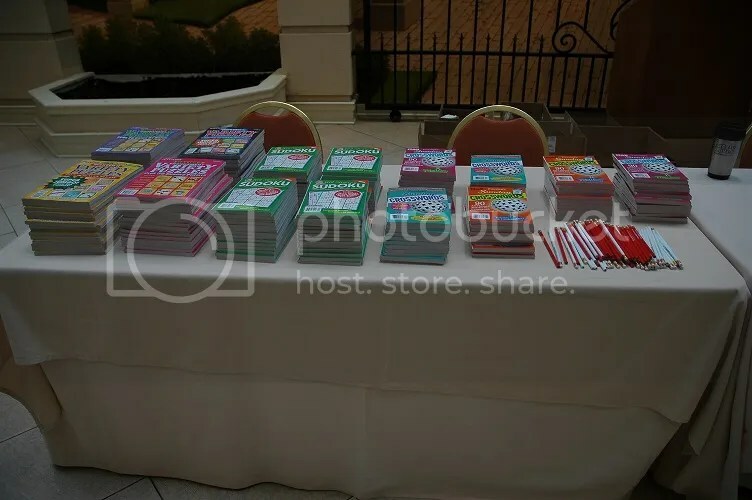 It was a sumptuous buffet of puzzly goodness, to be sure. 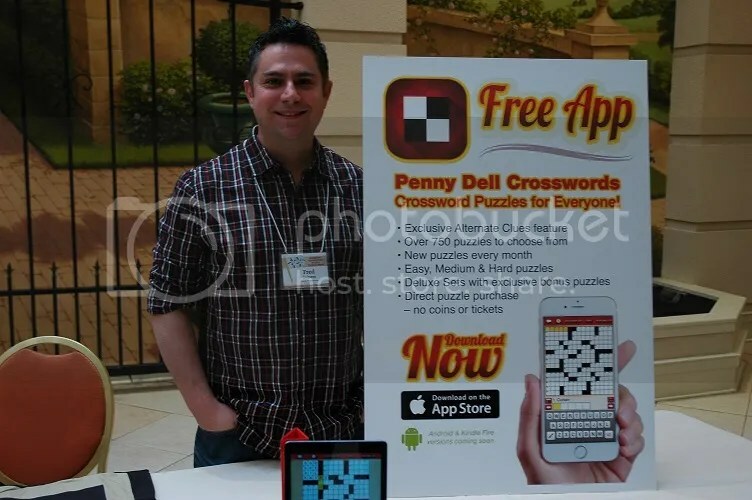 Joining me behind the tables were Penny Press proofreader and puzzler Debra Yurschak Rich and PuzzleNation‘s very own Director of Game Development, Fred Galpern, who was on hand to show off the Penny Dell Crosswords App. 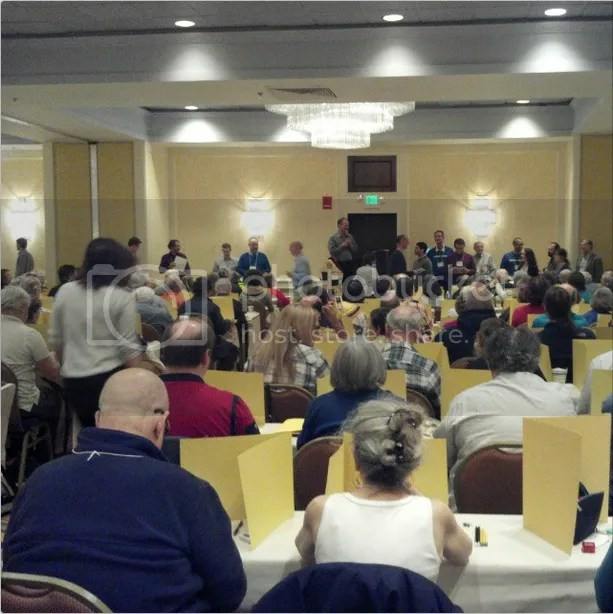 We had a few hours before Puzzle #1 would kick off the tournament, so I wandered around, checked out the ballroom where the competition would take place, surveyed the other booths, and chatted with many tournament competitors and puzzlers. Not only did I get to see friends of the blog like Uptown Crossword Club editor Patti Varol, author and puzzler Eric Berlin, constructor Ian Livengood and Penny Press variety editor Keith Yarbrough, but it was a great opportunity to match names and faces, since I’d had the chance to tweet, email, and otherwise interact with many of them online over the last few years, but never actually met them in person. Among the folks I got to meet were crossword gentleman Doug Peterson, New York Times Wordplay blogger Deb Amlen, constructor and Pre-Shortzian Puzzle Project curator David Steinberg, constructor Joon Pahk, top solver and former champion Ellen Ripstein, Los Angeles Times crossword editor Rich Norris, constructor Alan Olschwang, Evan Birnholz of Devil Cross, top competitor and former champion Tyler Hinman, and New York Times puzzle editor Will Shortz. 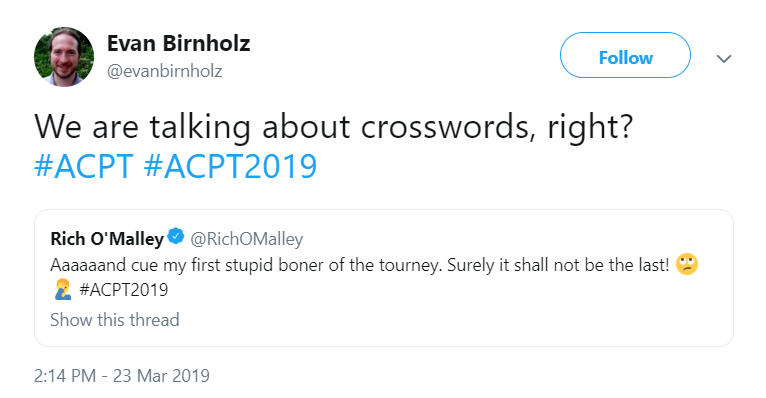 One of my favorite things about the tournament is the absolute and unabashed puzzle love shown by so many competitors. 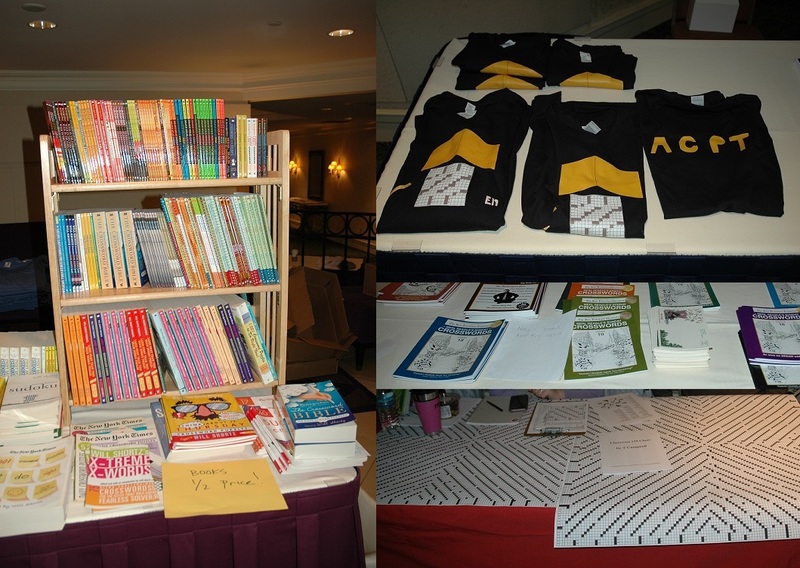 I saw crossword-patterned sweaters, ties, shirts, and earrings, as well as punny t-shirts of all kinds. 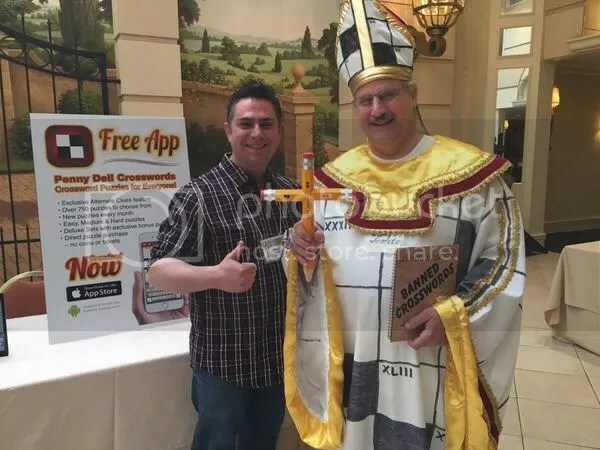 One guy even dressed up in full papal regalia, but with a crossword theme! 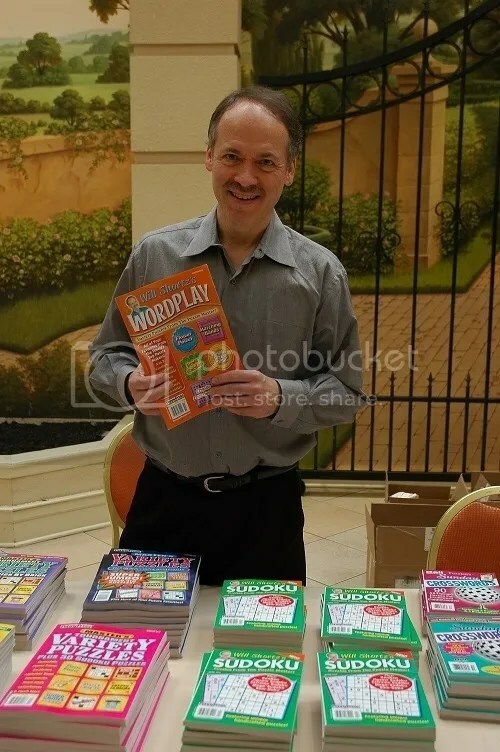 Finally, it was time for the tournament to begin, so the competitors filed into the ballroom where Will Shortz introduced Puzzle #1, created by Tracy Bennett, which would be a Monday difficulty puzzle. 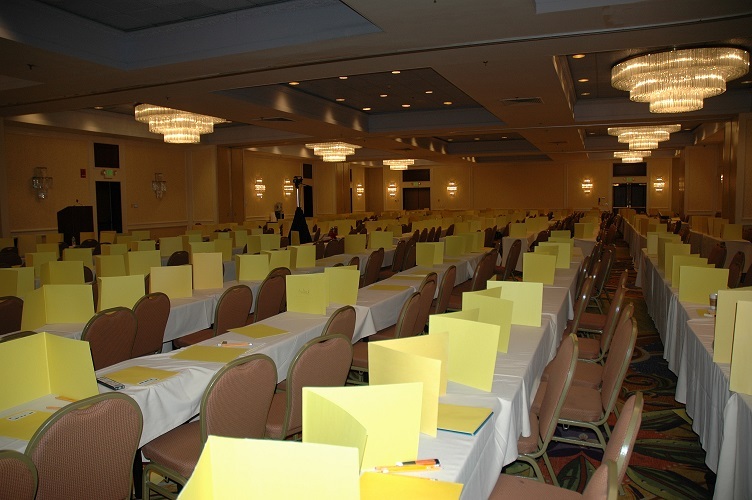 It’s an excellent warm-up puzzle for competitors, and rarely one that poses a significant challenge. 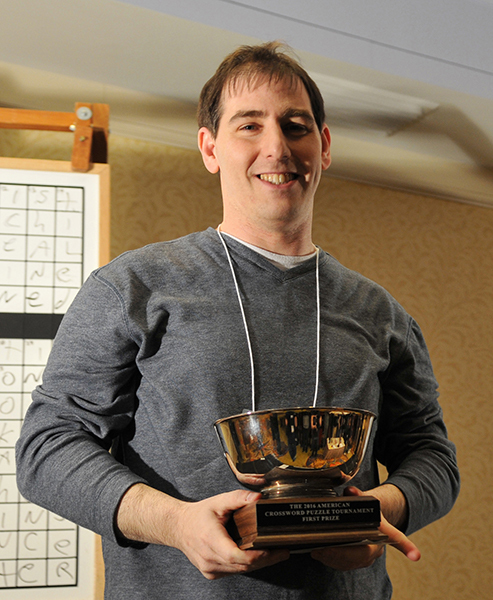 Dan Feyer, reigning five-time champion, set a new tournament record by completing Puzzle #1 in under two minutes. WOW. 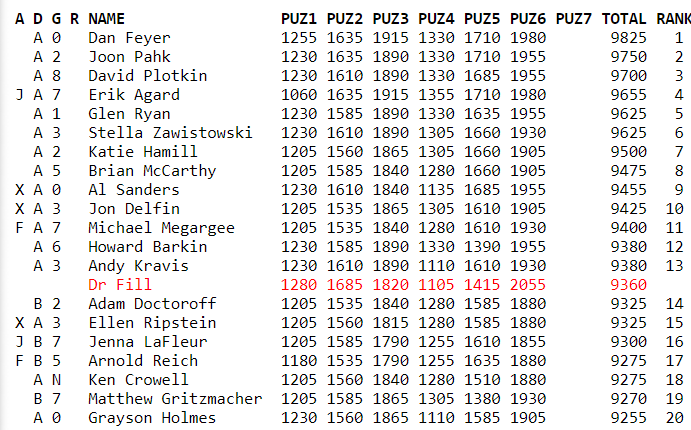 A weird scoring anomaly took place when the Puzzle 1 results were announced, when a solver named William Hall appeared to have solved Puzzle 1 a full four minutes before Dan Feyer did. 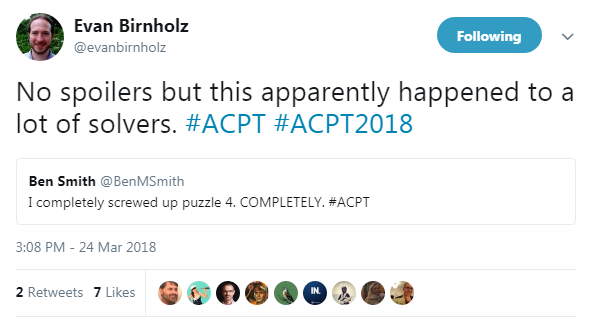 Since Dan solved the puzzle in less than two minutes – believed to be an ACPT first – that meant that Hall would have had to do some serious messing with the time-space continuum to finish the puzzle TWO MINUTES BEFORE HE EVEN STARTED. 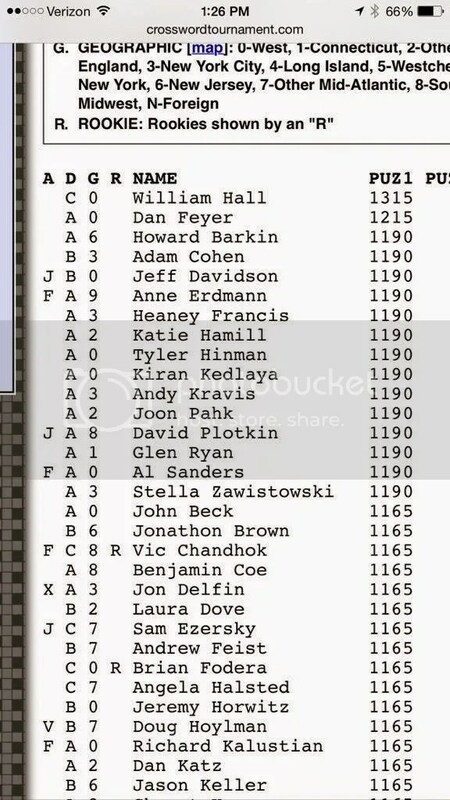 The glitch was soon resolved and Dan Feyer returned to his proper spot at the top of the leaderboard. 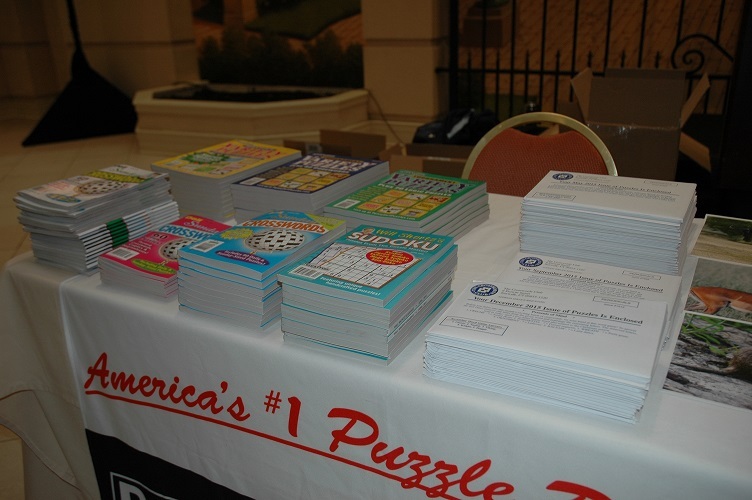 Puzzles #2 and #3 (constructed by Joel Fagliano and Merl Reagle, respectively) proceeded without any scoring scandals, and throughout the day, I was getting great insight into the puzzles themselves and the energy of the room with post-puzzle updates from Keith, Patti, Doug, and some of the other competitors. 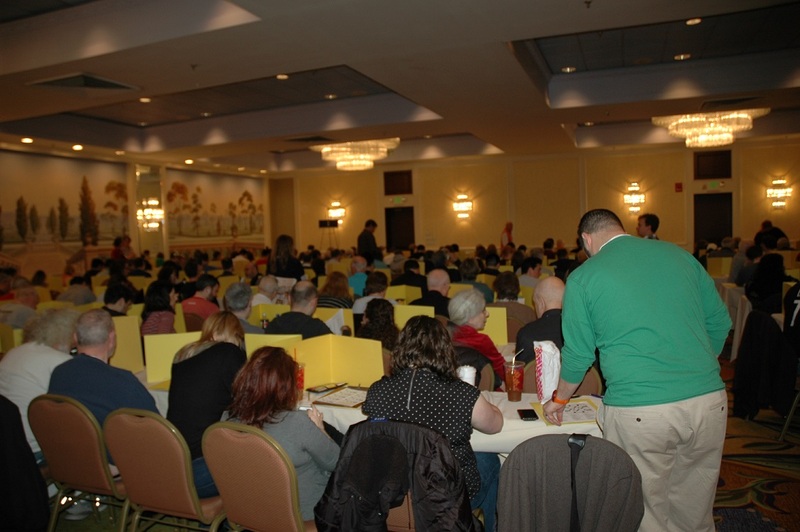 After a break for lunch, the ballroom filled once more for Puzzle #4, Paula Gamache’s contribution to the tournament. 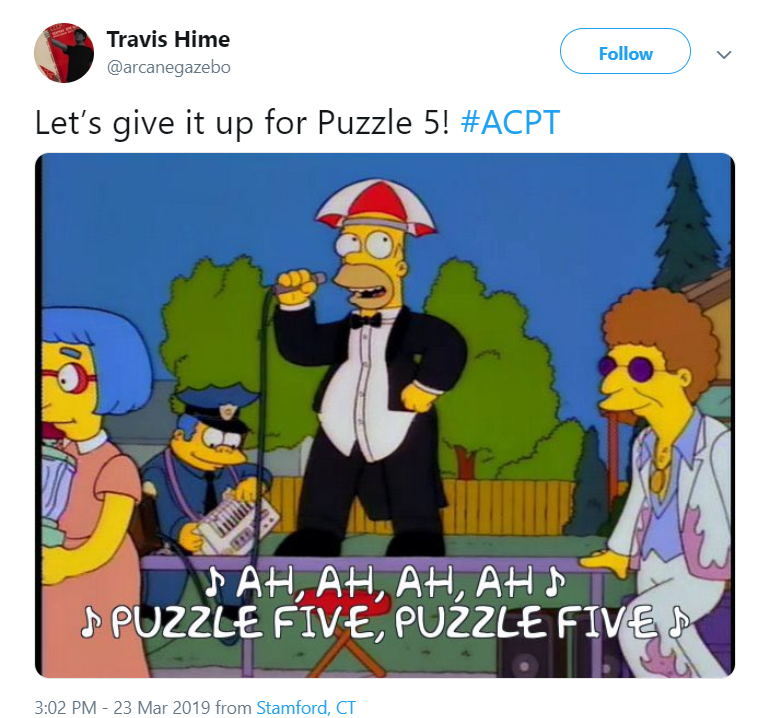 And then, it was time for Puzzle #5. 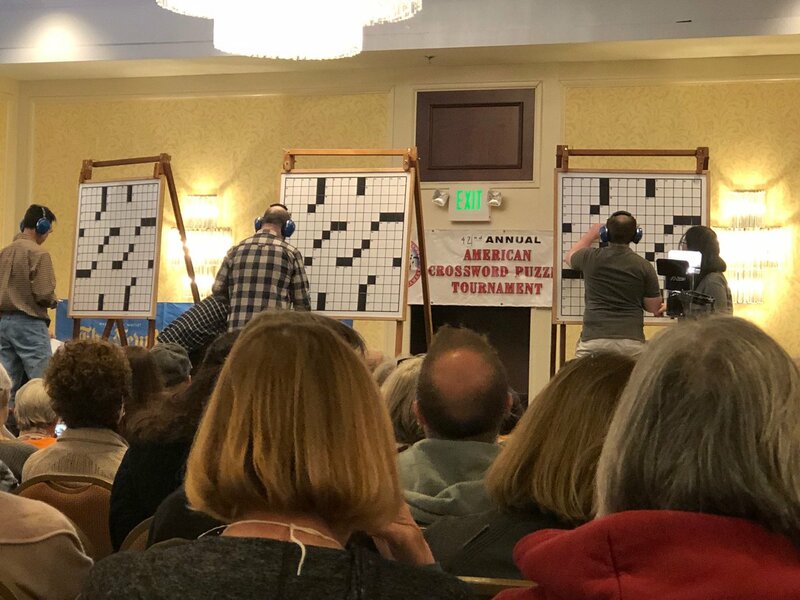 The day’s puzzle wrapped up with Puzzle #6, a Lynn Lempel creation that helped set the stage for Sunday’s remaining two crosswords: Patrick Berry’s Puzzle #7 and Byron Walden’s championship closer. 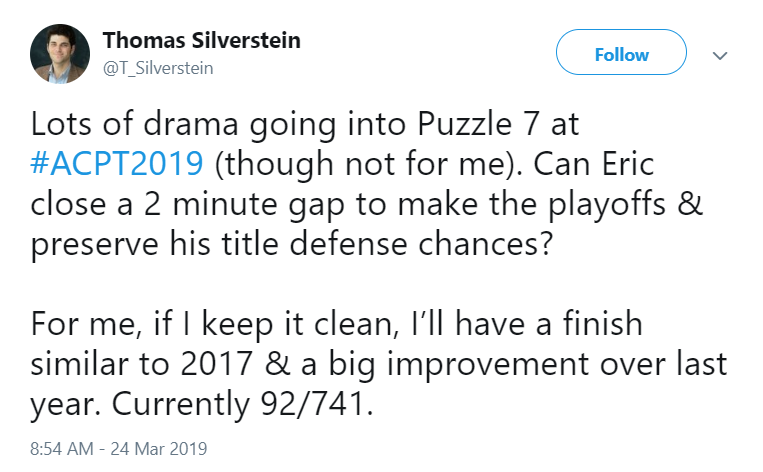 And although I wasn’t present for Sunday’s tournament finale, I continued to get updates from friends and fellow puzzlers throughout the day. 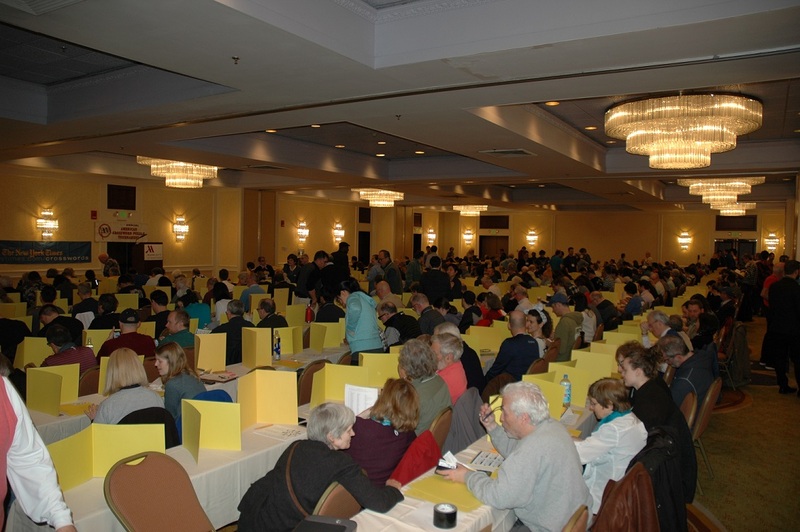 When it came time for the top three to solve on their white boards in front of their fellow competitors, a familiar trio of names were listed: Dan Feyer, Tyler Hinman, and Howard Barkin. 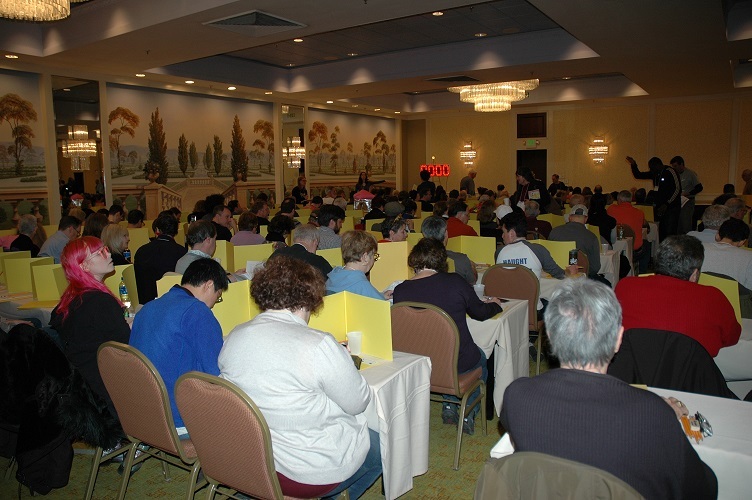 Due to his performance over the previous seven puzzles, Dan began with a 5-second head start over Tyler. And that made all the difference. 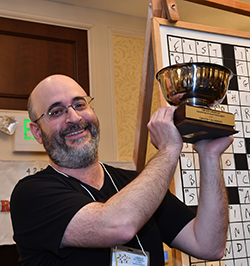 Only a half-second separated Dan and Tyler’s times, a nail-biter in ANY competition, but Dan Feyer locked up his sixth straight ACPT championship! Not only did he top Tyler’s streak of 5 straight wins, but he’s put himself in contention to match Jon Delfin’s record of seven tournament victories next year! Names like Anne Erdmann, Francis Heaney, Joon Pahk, and Al Sanders were not far behind. 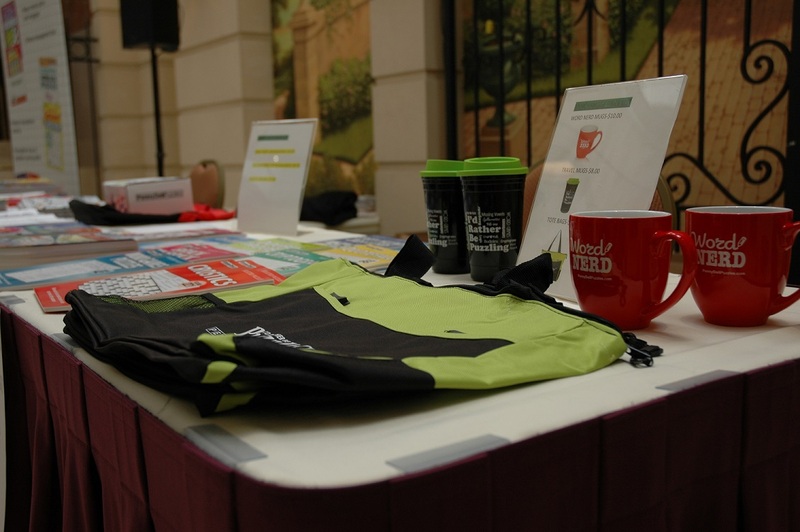 And out of more than 560 competitors, friends of the blog had a strong showing themselves! David Steinberg ranked 36th overall, and was named the Division C champion, the youngest ever! Patti Varol placed 109th, and only a few steps behind her was Eric Berlin at 112th! 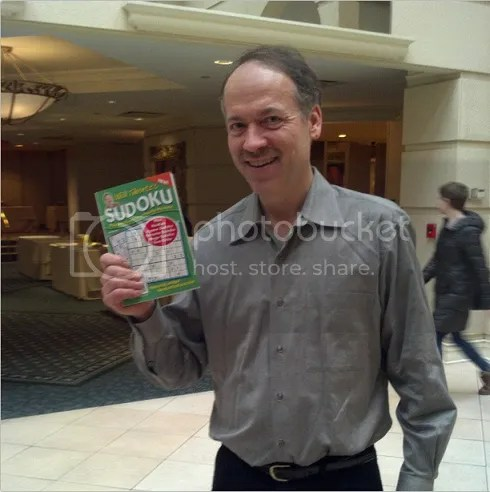 Keith Yarbrough placed 177th, and Doug Peterson was the top performer in our little cabal of puzzlers, delivering some outstanding solves and placing 14th overall! 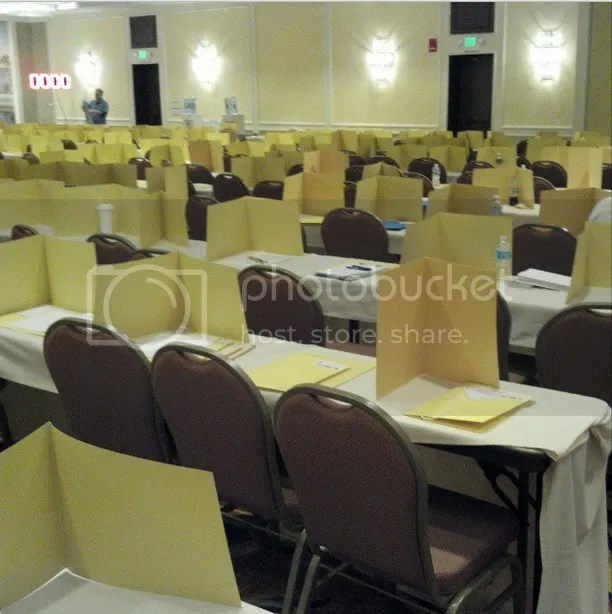 I’ve never experienced anything quite like the ACPT, but I’m definitely going back next year. Congratulations to all the competitors!